Flour Bluff’s colorful history begins with the archaeological evidence that suggests that pre-Karankawa peoples used the area near Oso Bay as a burial ground between 500 B.C. and 500 A.D., long before the Karankawas waded along the shores of the Cayo del Oso and Laguna Madre in search of food. In 1838, the Encinal Peninsula was used as a hand-off spot by Mexican smugglers during the Pastry War between France and Mexico. In May 1841, Philip Dimmitt, a hero of the Texas Revolution, built a trading post, probably at Flour Bluff Point, to compete with Henry Kinney’s trading post, a move that didn’t set well with Kinney. Many believe the rivalry between the men launched the contention between Corpus Christi and Flour Bluff, that in some ways still exists. Be that as it may, in its early days, Flour Bluff attracted all kinds of entrepreneurial types looking for a place to start a new venture, some of which would be considered a bit odd. There is no record of grapes ever being grown in Flour Bluff, but the 1000 acres crops up in other tidbits of news. It seems that another San Antonio fellow by the name of R. L. Timmins purchased 1000 acres in 1907. It is not clear if it was the same piece of land. According to Bill Duncan, writer for the Corpus Christi Caller-Times in 1963, Timmins bought the land from Theodore H. Koch, a man from Minnesota. Timmins then sold the 1000 acres to Ed Duncan of Tahoka. According to the June 9, 1963, article, a man named Gurney bought the land and started an ambitious nursery business on the Oso. It was complete with its own irrigation system from a large concrete reservoir. This nursery, located midway down the peninsula, only lasted a couple of years. 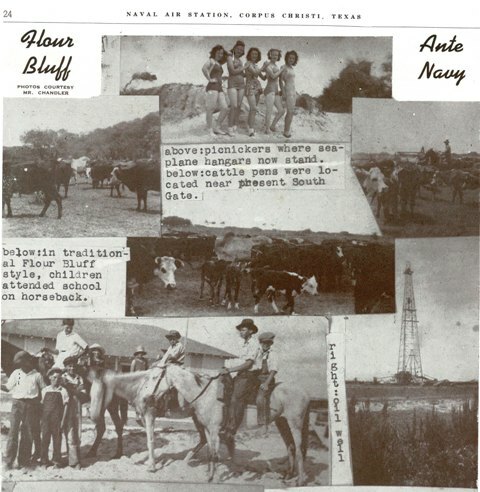 Retired Flour Bluff Junior High history teacher, Karen Howden, author of the Flour Bluff ISD Texas Historical Commission Marker, found information about ranching in the area. The free-range cattle, owned by the ranching families living in Flour Bluff at the turn of the century, often grazed the grasses near the school buildings. This prompted the building of fences to keep the cattle away from the school. Since the ranchers’ children were accustomed to living and working with cattle, the destructive nature of the beasts is probably what prompted the school officials to fence the bovine out. In the 1930s, significant finds of oil and gas were located in Greta, Sam Fordyce, Loma Novia, Lopez, Placedo, Plymouth, Flour Bluff, Benavides (or North Sweden), and Premont. However, exploration in the area began as early as 1912. In the advertising section of the January 5, 1912, Corpus Christi Caller, B. Walker posted a trailer for sale in the Humble Camp. The camp was located near the south gate of what is Naval Air Station Corpus Christi today. This perhaps explains why so many small houses are in that area north of the freeway in Flour Bluff. Oil and gas changed the landscape of Flour Bluff forever with the drilling of dozens of wells, the creation of roads to access the wells, and the clearing of land to allow for drilling to take place. Oil and gas production is still part of the Flour Bluff area. Abandoned ovens at the Seneca Glass Company, located at 709 Beechurst Avenue in Morgantown, West Virginia, United States. Built in 1897, the company complex is listed on the National Register of Historic Places. Unfortunately, the glass production went the way of grape production. Who knows what happened? Maybe no one bought into the idea. Perhaps the money just wasn’t there. Or, maybe the other ventures took over like the Flour Bluff sand bur. Whatever the case, Flour Bluff survived and thrived without them. WWII brought NAS Corpus Christi, which grew the community. In answer to that growth, E. J. Wranosky, a man with a vision of his own, took a country school that served the children of the ranchers, the oil field workers, and the fishermen and turned it into an independent school district that now serves as the number one attraction to Flour Bluff. God only knows what lies in the future of this little community with such a rich history.